Opioids are not among the most effective—or longest lasting—options available for relief from acute dental pain, a new examination of the results from more than 460 published studies has found. Ibuprofen and other nonsteroidal anti-inflammatory drugs (NSAIDs) alone or in combination with acetaminophen are better at easing dental pain, according to new research conducted with the School of Dental Medicine at Case Western Reserve University. The study examining relief of acute pain in dentistry—recently featured on the cover of The Journal of the American Dental Association—evaluated the safety and efficacy of dozens of pain-relief options. "What we know is that prescribing narcotics should be a last resort," said Anita Aminoshariae, an associate professor in the dental school's Department of Endodontics and one of the study's authors. Each day, more than 115 Americans die as a result of an opioid overdose, according to the National Institutes of Health. "No patient should go home in pain," Aminoshariae said. "That means that opioids are sometimes the best option, but certainly should not be the first option." Aminoshariae said the goal of the systematic review was to summarize data—using five in- depth studies—of the effectiveness of oral-pain medications. "The best available data suggests that the use of nonsteroidal medications, with or without acetaminophen, offers the most favorable balance between benefits and harms, optimizing efficacy while minimizing acute adverse events," she said. She cited the national opioid epidemic as one of many reasons why health-care providers should take note of the findings. The research found that, for adults, a combination of 400 milligrams of ibuprofen and 1,000 milligrams of acetaminophen was superior to any opioid-containing medications studied. "Our aim was to create a compendium detailing both the benefits and harms of these medications as a resource for dentists to use in their clinical decision-making," Aminoshariae added. The study also found that opioids or drug combinations that included opioids accounted for the most adverse side effects—including drowsiness, respiratory depression, nausea/vomiting and constipation—in both children and adults. "Each day, more than 115 Americans die as a result of an opioid overdose, according to the National Institutes of Health"
-illegal fentanyl from China that is, according to reality. "combination of 400 milligrams of ibuprofen and 1,000 milligrams of acetaminophen was superior to any opioid-containing medications studied." - and what are the effects of twice the recommended dosage of NSAIDs on the stomach and other organs? The respective given dosages are correct. 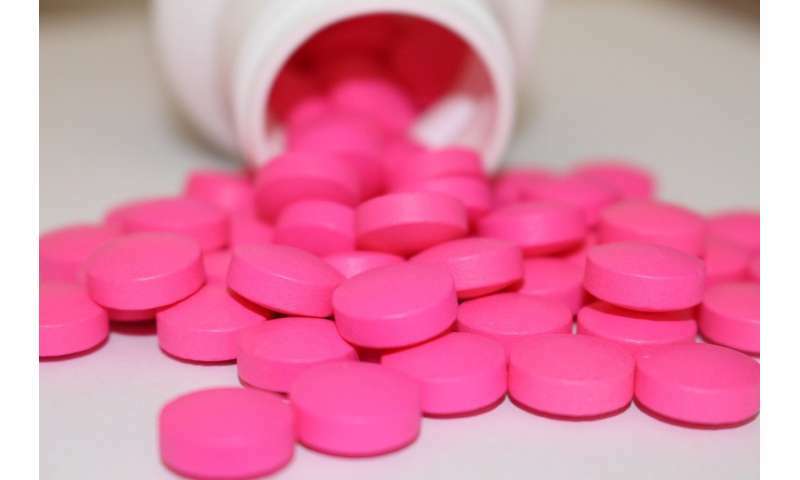 The most common (standard/basic) amount per ibuprofen tablet is 200mg,& 500mg per acetaminophen tablet. Taking them together increases the overall efficiency of how they help. I learnt that 'trick' from a Doctor a long time ago. It has also helped me keep any usage of panadeine(opiode) down to an occasional minimum. When I do need it, I also combine panadeine (500mg per acetaminophen included per tablet) with ibuprofen for better results. It works. Because of that, except in hospital, I have been able to stay away from nastier stuff.
" (500mg per acetaminophen included per tablet) "
" (500mg of acetaminophen included in each tablet) "
I had an impacted wisdom tooth surgery removal last week, coincidentally. And I am still in serious pain. I have both ibuprofen and acetaminophen. And yet the only thing that really helps is 8mg codeine+500mg acetaminophen pill. I can get away mostly with one pill rather than 2 doctor recommended to take at each dose, and do it because definitely the pill makes me less productive during a day. But constant pain makes me 0 productive! That is if I have to think rather than dig a ditch. So the pill helps tremendously. Long story short, this article is irresponsible in making a broad conclusion, that may lead to denying people needed pain medications. The right way, like in many other cases, would be to have only researchers afflicted by a specific illness to make recommendations on what is sufficient and what is not. I am sure the outcome would be quite different. "Acetaminophen has the potential for overdose or poisoning causing hepatotoxicity and acute liver failure, at times resulting in liver transplantation and death." One important point - opiates not only treat your pain, they change your opinion of it. This is off-label I suppose but not insignificant. And one reason why they are as dangerous as they are effective. I also think they relieve us of pain we aren't normally aware of, subliminal pain from accrued neurological damage due to lifelong exposure to toxins and infections and chronic inflammation.